Check out these Personalized Hats for ONLY $11.99 (Retail $24.99). 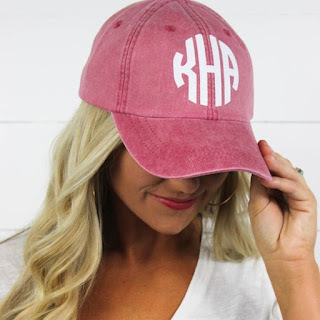 This Personalized Monogrammed Hat is perfect for any time of year! It is a perfect go to for running errands or spending a day on the lake! The monograms are made from commercial grade Glitter Vinyl and adhered by a commercial heat press to make a forever lasting monogram! These have a tuck-away leather backstrap with an antiqued brass buckle and grommet.